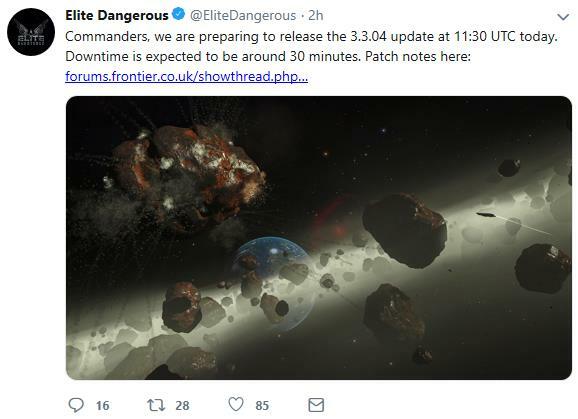 Frontier Development will be taking Elite Dangerous offline for about 30 minutes today in order to push out the latest 3.3.04 Update. The notes are straightforward, as this is not a big patch, but does update a few critical areas. Many impact direct gameplay, such as control updates, comm fixes and network connectivity issues. Check out the full list below, as the update should be wrapping up here anytime. The Elite Dangerous servers will be offline for all platforms at 11:30 AM (UTC) today for approximately 30 minutes as we apply the 3.3.04 patch. Thank you for your patience and we'll see you in the black!